This is the third part of the tutorial. In this part, we are going to use Devise & CanCan in order to add authentication and authorization features to the application. Our users will register to the application using their email address and they will receive a confirmation email in order to activate their account. Before introducing Devise, you’ll get to know MailCatcher which is an awesome gem for simulating a real smtp server. We will configure the application to use it when in development mode. The first line defines which host is going to be used while converting the relative paths in our emails to absolute ones. The second ones defined the protocol to be used and the last one sets the settings of the smtp server. 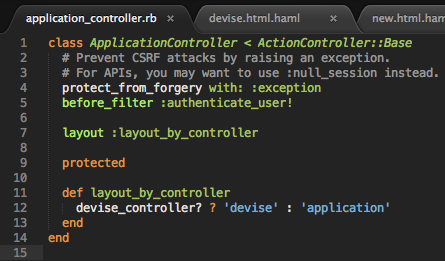 Devise is a gem that will provide us with almost anything about authentication. The first one configures the devise and second one has localized messages used by the gem. With this command, we created our User model & the migration that will create the table for the model and we also added automatically the appropriate routes for registration/sign in/confirmation etc. Before applying the migration, we will create another one because we want to enable the confirmable option so that our users confirm their account before start doing anything with the application. 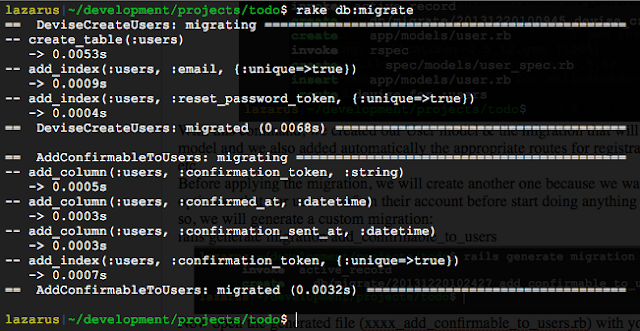 This migration will add columns to our users table to keep information about confirmations. We just added the :confirmable option. We have a sign in form! Where did this view come from? Thankfully, devise gives us the option to generate the default views inside our application’s views folder so that we can make changes on them. 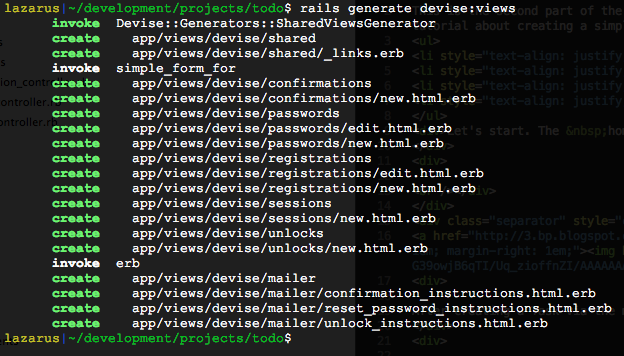 By default, the generated views are of erb type and since we are using haml we will follow one more step. At this point, it would be a good exercise for you to convert all generated views to haml (don’t forget to change the file extension to .html.haml) but there is another way. I got a bunch of warnings from the last command but the conversion was successful. Ok, now we can edit these files and make the views look what we want. But instead of “centralizing” all devise’s forms file by file we have also another option. We can create another layout (besides our application’s default) and configure the application to use it if the executed action belongs to a devise controller. = stylesheet_link_tag    "application", media: "all"
Refresh, you should be automatically redirected to the sign in page. Confirm you account following the link and login. So far so good, but something wasn’t quite nice. We should be seeing some default devise generated messages for the actions we executed (like “Successfully registered” etc) but nothing was displayed. Devise uses flash messages and currently we have done nothing about showing them. Nice. Let’s add some user related stuff to our application layout so that when logged in a user can see his username and a logout link. Edit application.html.haml and add the following inside the hero-unit. We added the current user’s email (using the helper method current_user provided by devise) and a logout link pointing to the destroy session path from our routes. Ok, we have added user authentication. Now before accessing the home page and all of its task related actions, an authenticated user is required. But, which task should a user be able to view/edit/destroy? Before messing with CanCan, we should think a little about our models. 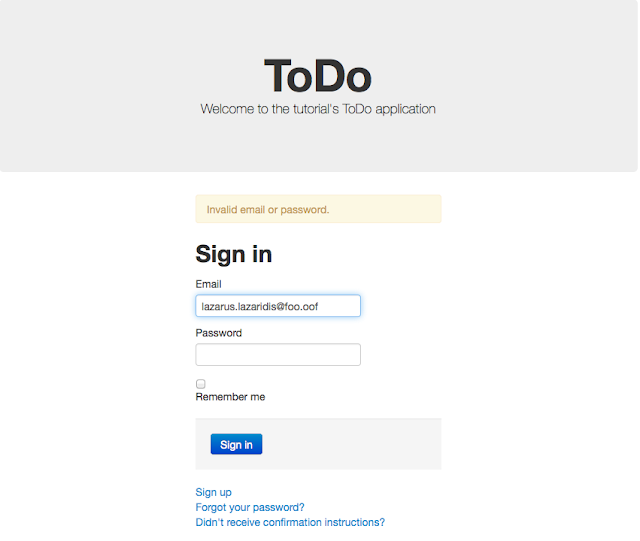 We have users and tasks. 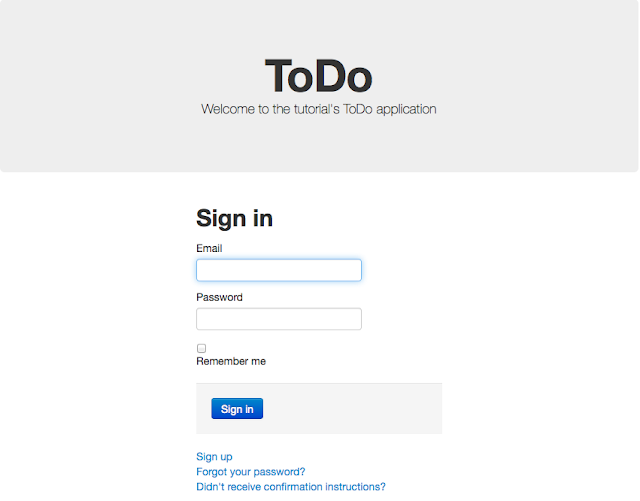 We want each user to manage his/her own tasks without being able to do anything to tasks that belong to another user. Now we must tell to both our models about their association. Rails understands in both cases which model is being associated by the value of the symbol. CanCan o’Clock. 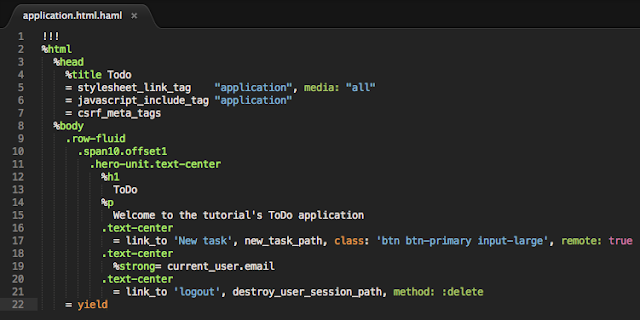 We will use CanCan in order to protect a user’s tasks from being accessed by another user. Here we define that a user can execute any kind of action on a Task only if the task’s user_id attribute matches the current user’s id. We will apply the limitations above using the CanCan’s authorize! action. This method accepts two parameters, the action (symbol) that will be executed and the object on which it will be executed. All actions in the authorized! calls could be replaced by the :manage symbol but I wanted to show you your options in case you had defined different abilities per action. 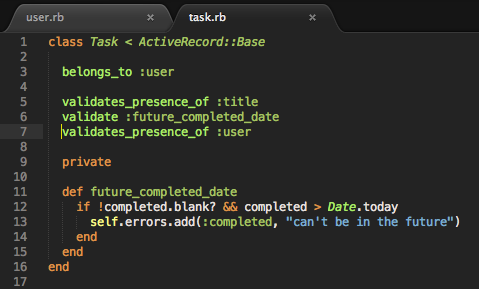 This line will “fill” the user_id of each newly created task with current user’s id. After all these changes, if a user tries to edit/update a task that belongs to another user, an AccessDenied error is going to be raised. Note: the task_params method we defined in the previous part of the tutorial protects our task model from being assigned with a user_id from the parameters. 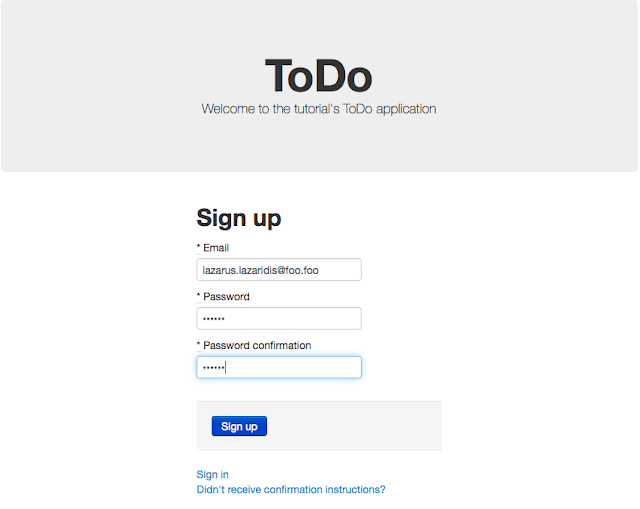 In the home page we show all the tasks. ALL the tasks. This isn’t right. So there is a last thing to do. Filter the tasks. Thankfully, CanCan provides us with a very nice way to do this. 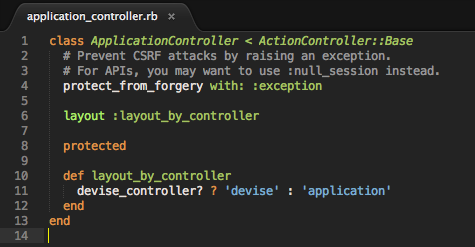 A model scope that uses the ability.rb permissions! And now we are fine. 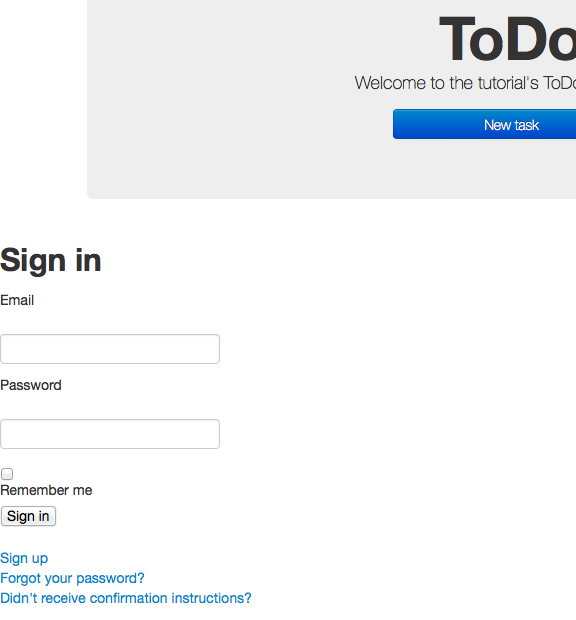 I suggest you register more users and start messing with the user_id attributes of your tasks to see the authorization being applied. 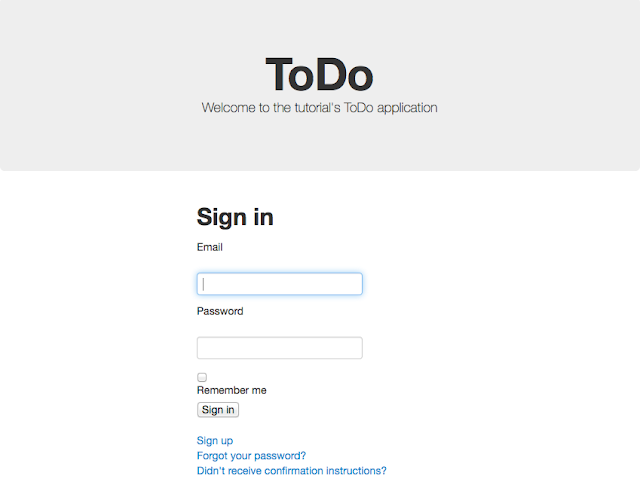 This is the last part of the tutorial that we actually implement stuff for the ToDo application. There is going to be a final part in which I am going to help you deploy the application to OpenShift!